The holidays are here and it’s a special time to find that perfect gift for loved ones! Let’s face it, the seniors in our lives have had the opportunity to use hundreds of products throughout their lifetime which can make it challenging to find that special something that is both exciting and useful to them. There are many products on the market designed to make life easier for seniors. 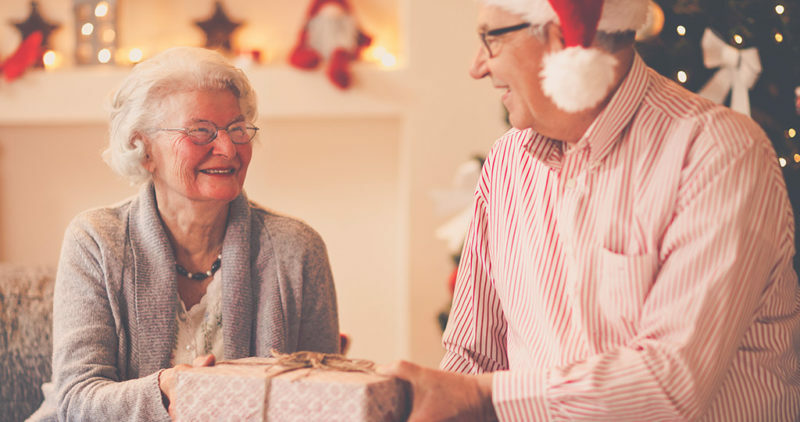 We have compiled a list of gift ideas to help you get the smile you’re looking for as the senior in your life unwraps your gift! Seniors are often on medication to maintain healthy living. Special challenges can arise due to memory issues or illness, like dementia, which can make it difficult to remember which pills to take at what time. Consider gifting a smart pillbox to help your loved one keep track of their medication. These boxes have exchangeable cartridges which let you arrange the right number of pill compartments for each day of the week. The device will also sound an alarm when it’s time for a dose. Hearing weakens with age, but smart hearing devices can help enhance senior hearing and increase social competence. If you have noticed that your loved one doesn’t hear as clearly as before, consider purchasing this hearing device that can be fitted discretely behind the ear. It is comfortable to wear and can smartly adapt sound volume to moderate levels. A simple music player can help marry modern technology with the comfort of vintage design. Take this music player for example – it is easy to use, but still offers all the quality and clarity of digital music. A gift like this can provide hours of entertainment and comfort to whomever receives it. DVD box sets of classic television series can help guide your loved ones down memory lane. Find the perfect set of DVDs and spend time with your loved one watching their favorite programs and enjoy the nostalgic and happy memories they bring. Even if you are the primary caregiver, you can’t always be around your loved one. When you have to step out, a medical alert device can help keep seniors safe. It allows seniors to access emergency help and connect with close relatives whenever they need it. It has a GPS tracker for easy location and users can seek help when inside the house or in the street. Those in our lives with limited mobility or vision may still have a great love of reading. Rather than having to handle heavy or clunky bound books, gift your loved one audio books which they can easily listen to with an audio device. Spend some quality time helping them access their new audio books on a tablet, their computer, or even a smartphone. Local libraries also offer access to thousands of audio books which can be checked out with a library card. Seniors, whether living at home or in a facility, may have quite a bit of free time which can cause loneliness or boredom. Games are a good gift for seniors because they can help seniors stay engaged during the holidays and all year round. Choose enjoyable games that can be played alone or in the company of others such as Scrabble, crosswords puzzles, or sudoku. Seniors often face memory challenges as they age and may forget important daily tasks. A reminder alarm clock will help remind seniors what to do and when to do it. Daily routines such as wake up times or medication reminders can be set easily with voice commands, allowing seniors to set reminders any time they need to. Even though seniors may be physically active and still carry out chores, they might need a break every once in a while. The robot vacuum cleaner can help them reduce their workload. With a button, they can activate it and watch it clean the carpets on its own. While you can surprise your loved one with any of the above gifts this holiday, don’t forget the gift of companionship. The seniors in your life, whether parents, grandparents, family, or friends would certainly appreciate you spending some quality time with them. Don’t hesitate to plan get-togethers or short trips with them. Seniors are a gift to us and we should all celebrate them!